A few days ago, in honor of the Academy Awards, I showed you Julep Viola topped with Julep Oscar. I received these 2 polishes in my Julep Maven box for February. I also received the other polishes, as well as Viola and Oscar, to review. Elizabeth - Deep purple with multicolored shimmer. 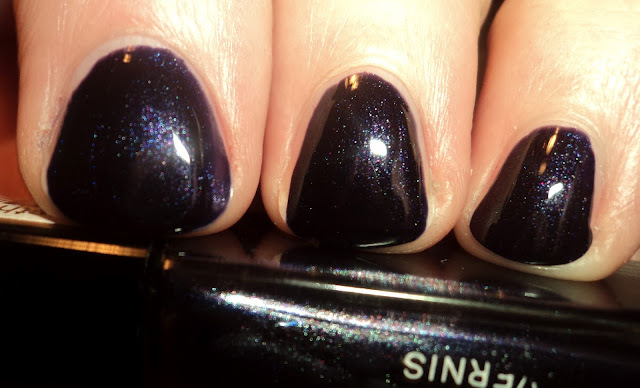 This one reminded me of a darker, blackened version of Grape...Set...Match from OPI's Serena Williams collection. The shimmer in this amazing. Formula was perfect. 2 coats. Glenn - red foil. In the bottle and on the nail, this one was more true-red, than berry red, as shown in the picture. That said, it's still a gorgeous color. This one had the best formula of the 7 in the collection, and though it's a red, it's probably my favorite. It really reminded me of OPI's Red Like Roses or Never Lon-Done Shopping (both favorites of mine and both long-discontinued). This will look fantastic around the holidays. 2 coats, but it was opaque at 1. Marisa - deep blue shimmer. 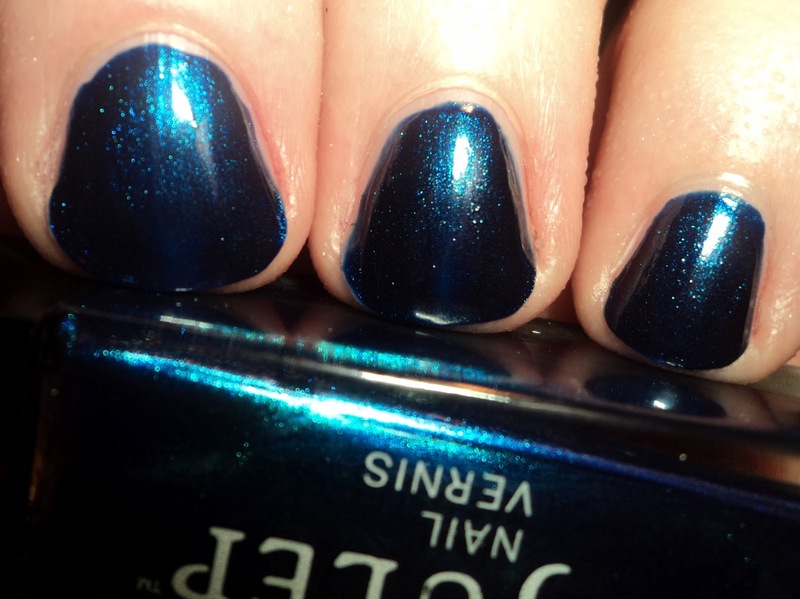 Julep's website and PR information called this one a "cobalt blue". However, IMO, it's more of a very deep cerulean blue, as it does lean a bit green. It almost reminds me of bluer Zoya Charla (and all the dupes), though it's much darker, and doesn't have the foily finish. Y'all know me and my sparkly blues, so it will come as no surprise when I say I love this one. 2 coats. Meryl - medium true grey. I'm calling this a medium grey, but it's definitely on the lighter side of medium. It's also not a taupe or a "greige", but a true grey. I was kind of afraid it would wash me out or give me lobster hands, but it looked fine with my skin. This collection is full of deep rich colors, so, at first, this grey creme seemed a bit out of place. And I still wish they'd gone with something more vibrant for Meryl Streep, though when you think of it this matches her hair in "The Devil Wears Prada", so maybe they were right on the money. LOL. The formula on this one was thin, but very manageable, and was opaque in 2 coats. 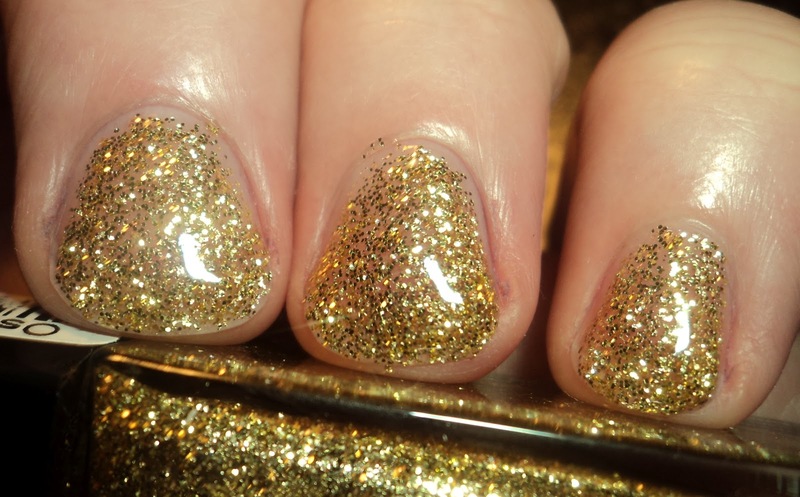 Oscar - bright gold glitter. As I mentioned in my earlier review, this can be worn as either a top coat or on it's own. This is 3 coats of Oscar, so it is possible to reach opacity without having to apply a gazillion coats. This is gorgeous, but somewhat distracting, and I'm not sure how this would be a practical look unless, of course, you were going to a party at Puff Daddy's house, but nonetheless, it's a beautiful glitter. Application was super easy. 3 coats. Rachel - Deep copper shimmer. 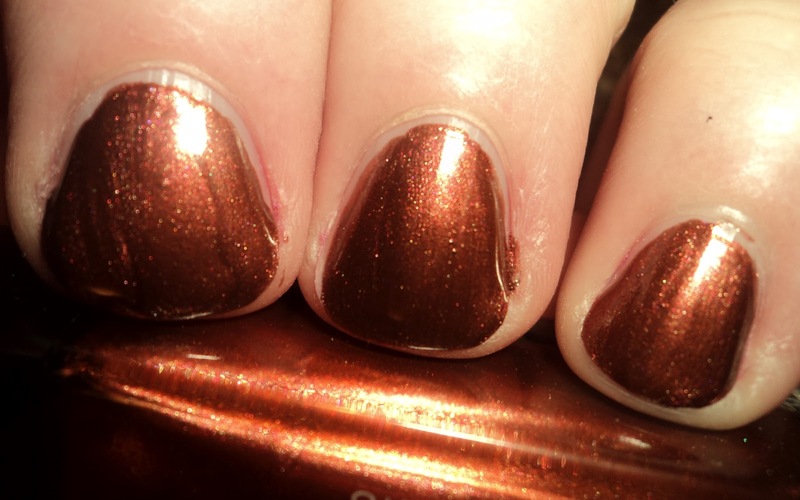 This one reminded me of another copper by Julep, Zoe, though this one was much more wearable for me. Rather than looking like a new penny, it looked like an old penny, only shiny (if that makes sense). It also had that beautiful effect of looking blackened around the edges, kind of like a copper version of China Glaze Thunderbird. The application on this was fantastic. It was a little brushstrokey, as you can see in the pictures, but in all honesty, without the macro, the strokes weren't noticeable at all. 2 coats. Viola - deep browned purple. 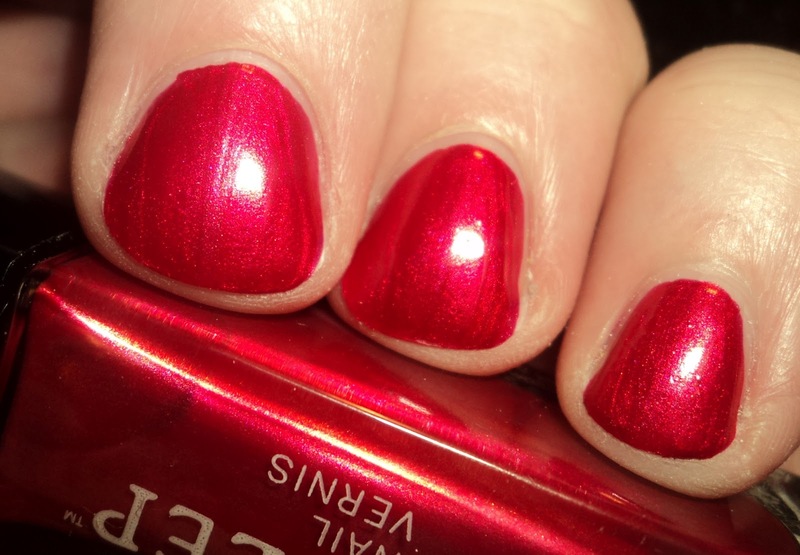 As I mentioned in my previous post, this is a fantastic vampy color that I think looks amazing on shorter nails. I also think this one is a bit unique in the fact that there is a good amount of brown in the base, so it's not a straight-up vampy purple. Also, unlike a lot of other colors like it this one does not look muddy without topcoat. I find that a lot of vampies can look muddy or dull until you layer them with TC, but that did not happen with this one and that gives it a major thumbs-up from me. Additionally, I wanted to mention that in my previous review, I stated that I had a hard time with the application because the polish was very thick. However, with the bottle that I received with this collection, rather than the one in my Maven box, I had none of the application problems I had before. It applied very well, and in fact, was a lot like Meryl in that formula was a little on the thin side. So perhaps I just received a bum bottle in my Maven box. 2 coats. As I previously mentioned, I am a HUGE fan of the movies and the Oscars, so I love this collection. Glenn, Marisa, and Elizabeth were the definite standouts for me, though there wasn't a dud in the bunch. Julep polishes are available on their website. They are a little on the pricey side at $14 a bottle, though I recommend following them on Twitter and FB because they are often running discounts and specials. You can also sign up to be a Julep Maven and receive a selection of polishes and other products for $19.99 and they often have codes to get your first Maven box greatly reduced. The red and the copper look GREAT on you. Well, all of them do, but those two are my favorite. I just now read your "ME" page again just to see if you updated anything on it and I actually LOL when I read, “Now at over 500 polishes, the real problem is finding a place to stash them all (and hide it from people that would deem me insane)”. Oh my! I TOTALLY understand what you mean now!!! I have about 7 plastic shoe boxes stuffed full of polish and I think to myself sometimes, “ whoa, if people could see this they would wonder if I had a problem!” LOL! AND, I just went on another polish run tonight!!!!!! 21 more “new” colors that I just had to have. Uuuuuug.